Shortly after starting to play he was introduced to the sounds of B.B King, and never looked back. 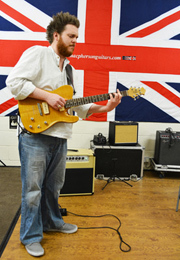 With a style that is influenced by the greats of the blues, funk, folk and beyond, Ben plays a pretty mean acoustic or electric guitar, and has a big voice to match. After years playing many gigs and sessions in many styles, with many different bands and people, Ben was inspired by a 3 month stay in New Orleans, (where he got a chance to play with a host of internationally renowned musicians.) to go out on his own, (or at least under his own name) with a fluctuating line up of co-conspirators, including some old faces and some new ones. He’s also finally getting round to doing some solo gigs. Things are going well, Ben has recently supported a number of great musicians – Robert Cray, Joan Armatrading, Albert Lee, Wilko Johnson, The Royal Southern Brotherhood, Jon Gomm, Matt Schofield and Simon McBride. He was a finalist in the 2013 New brunswick Battle Of The Blues and his song ‘Dealers Stealers’ was included on the soundtrack of the film “Rock and Roll F*ck ‘N’ Lovely” which was released in 2012.